Absolutely! We encourage expectant moms to continue to exercise throughout their pregnancies as long as everything has been approved by their physician. Instructors are qualified to lead our professionally designed pre/postnatal fitness programs that follow the latest American College of Obstetricians and Gynecologists (ACOG) guidelines. We can modify any exercise that poses a challenge as you progress through your pregnancy. FIT4MOM® recommends you obtain your doctor’s approval prior to beginning Stroller Strides/Stroller Barre. If pregnant, please speak with your physician before your first day and email nicolenorris@fit4mom.com to obtain a prenatal approval form. 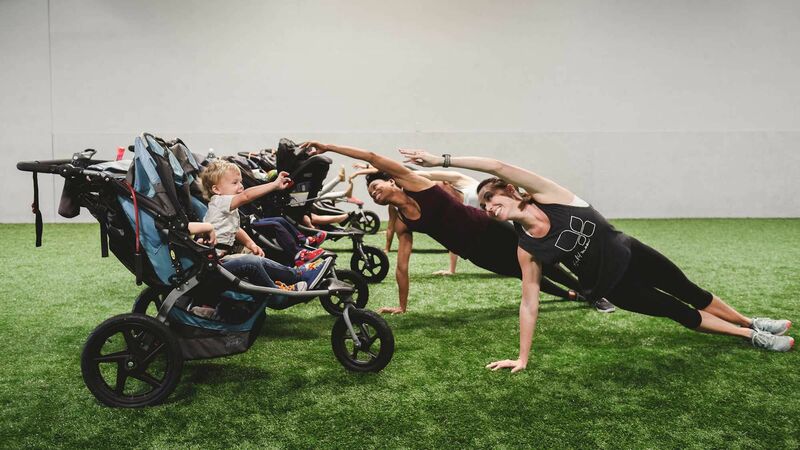 Your first Stroller Strides class is always FREE! This allows you to see first hand if Stroller Strides/Stroller Barre is a good fit for you and your little one! If you sign up here and create a profile, your first FREE class is automatically gifted to your account and you can come try us out! In case of inclement weather, outdoor class locations may change. Follow us on Facebook and check for updates an hour before class starts. We also send notifications to our client list via email if we have enough advance notice. For BODY BACK Transformation sessions, pre-register to ensure your spot in the class. Body Back sessions sell out quickly, so you want to hold your spot by registering early. For BODY BACK Workout classes or drop-in classes, pre-register so your instructor knows to expect you and can contact you if there are any changes to the class. We require a minimum number of clients to be enrolled in order to offer that class. If you cannot make it to class, you need to cancel with at least 24 hours notice or you will be charged for the class. A 30-day notice is required to cancel your membership. A copy of the policies can be found on the website. Your membership includes unlimited classes at any of the FIT4MOM Weste locations. We also offer special incentives for our other programs (Body Back, FIT4BABY) to our members if you are interested. Membership also includes being a member in our closed Facebook group, weekly playgroups, monthly Moms’ Night Outs and more! Visitors are welcome to come to class FREE of charge! If you have an extended-stay guest who will participate longer than one week, they will be subject to a $5 per class charge. All visitors must sign our waiver in order to participate. Email Nicole Norris@fit4mom.com to change the status of your membership. All requests need to be received in writing 30 business days before the next payment is due. Memberships will be placed on hold for the maximum of 4 months. You can return from your hold on any day of the month. You need to email Nicole Norris@fit4mom.com at least 24 hrs prior to your return. If you attend class without letting Nicole Norris@fit4mom.com know, you will automatically be charged the hold attendance rate with the credit card on file. For all memberships: There is a $5 per month fee to place your membership on hold. Memberships can be placed on hold for 1 to 4 months. Can I attend classes when my membership is on hold? For Stroller Strides memberships: When your membership is on hold you can attend classes at the drop-in rate of $10 per class. For Body Back memberships: When your membership is on hold you can attend classes at the drop-in rate of $12 per class. Your credit card on file will be charged automatically. There is a $50 enrollment fee for all new monthly memberships. If you sign up for membership on the first day of class you pay a $25 enrollment fee. If you cancel your membership and then wish to rejoin, you pay a $15 reactivation fee to rejoin. Stroller Strides members who transfer to us from another franchise outside will be charged a $15 enrollment fee. There is a $75 enrollment fee for all new monthly memberships. There is a $37.50 enrollment fee if purchased on the first day of class. If your monthly dues payment fails and you do not respond to our emails to update your credit card info, your membership will be cancelled. Click here for Pike13 website.